Director: Stephen Williams. Cast: Peter Williams, David Smith, George Harris, Judith Scott, Clark Johnson, Leonie Forbes, Ardon Bess, Tyrone Benskin, Rumble, Rino Romano, Denise Jones, Michael Hogan, Ron White, Tony Craig. Screenplay: Stephen Williams. Twitter Capsule: Jamaican-Canadian drama exhibits more conviction than craft, not always choosing most interesting relations to probe. VOR: ② Aside from the unique communal milieu, too much of Soul Survivor's story and style feel overly familiar. You don't have to probe too far in the Cannes 1995 listings to note which cresting waves the Croisette was trying to catch. In addition to the programmers' hard turn into all things British or Balkan, the schedule is a time capsule of the Pulp Fiction craze (The Usual Suspects, Things to Do in Denver When You're Dead) and of Hugh Grant mania (An Awfully Big Adventure, The Englishman Who Went Up a Hill But Came Down a Mountain). If those trends were in full force, some other early-90s ripples were already ebbing. The New Queer groundbreakers remained on the scene but were already chasing different game (To Die For, Safe), while the more forthrightly gay films (Carrington, Madagascar Skin) largely avoided the semiotic density of a Poison or a Private Idaho (though Robert Lepage's Le Confessionnal inclined in this direction). Meanwhile, the New Black Cinema of a few years prior was represented by two Canadian sidebar entries: Clement Virgo's Rude in Un Certain Regard and Stephen Williams's Soul Survivor, which kicked off Critics' Week. Even more than opening a whole division of Cannes, carrying the mantle for "black cinema" is a lot of pressure to put on such a low-budget affair as Soul Survivor, unmistakably the work of a first-time feature director. Set among the Afro-Canadian population of Toronto, and principally its Jamaican community, the film's cultural milieu is its obvious badge of distinction, but this, too, entails some tricky balancing. You can see how Soul Survivor wants to foreground this unique aspect without commoditizing it into a form of Difference or inviting a touristic gaze. Yes, the film starts with some lithe camera movements through an indigo-lit dancehall, throbbing with the first of its many conspicuous reggae tracks, and key scenes revolve around barber shops, eateries, and businesses catering to black folks. Just as many scenes, though, follow conventional crime-story beats in ways that broaden the story beyond its specific idiom. In truth, Soul Survivor plays as much like Things to Do... or the Kiss of Death remake, also playing Croisette, as it does Boyz N the Hood, but there's a price for downplaying its cultural specificity, which entails the film's only reliable barrier against anonymity and cliché. To watch the film now is to linger on its soundtrack and its runway show of Kingston-inspired and post-New Jack threads (the men's shirts are mostly huge and boxy), while also noting how hard Williams tries to give the film some visual oomph beyond its cultural signifiers. He is only half-successful: it's one of those debuts that opts too often for canted angles and unmotivated shafts of silvery-blue light, when a more restrained visual approach might coax more power from crucial confrontations. The plot, having laid out its premise, goes just where you'd think. 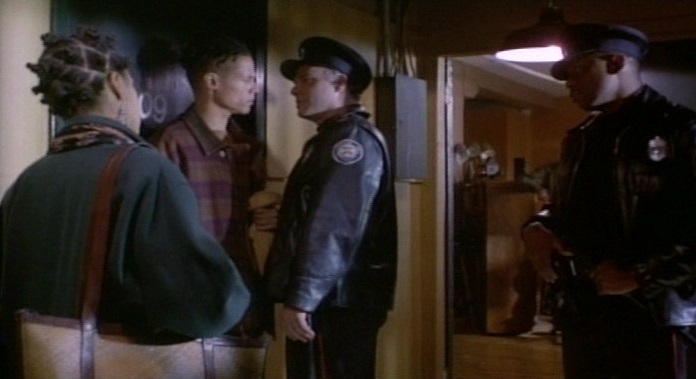 Young and handsome Tyrone (Peter Williams, the director's brother) is trying to stake out his own claim in Toronto, where a lot of the high-rollers and potential employers are transparently shifty, and where his headstrong cousin Reuben (David Smith) has already run afoul of a few obvious heavies. Tyrone sets about establishing himself, staying out of the police's sights, pulling Reuben onto the straight-and-narrow, and rekindling things with a lady named Annie (Judith Scott) whom he romanced long ago before dropping out of sight. If I quizzed you sight-unseen on which of these goals get met and which go disastrously wrong, you'd probably do pretty well. Soul Survivor doesn't act like it's breaking new ground; frankly, some of the flashier, more verbally flamboyant crime dramas at Cannes could learn something from its modesty. That said, its attempts to thread a lot of needles betray a neophyte's shaky hand: compensating for routine events with some gratuitous emphasis on "mood"; saying something about police targeting of black men while scoring visual and narrative points off criminal misdeed and charismatic amorality; making Annie a shrewd character with a clear voice but consigning her to a long, schmaltzy boudoir scene with Tyrone. To be fair, the film objectifies Tyrone's body even more than hers. The main point is that Williams seems willing to goose his audience with a hot track or a hot bod whenever he's rightly worried that his story has momentarily stalled. George Harris, probably the most established actor in the cast, doesn't get quite enough to do as the quietly intimidating Winston, and in general the film might have moved into more interesting directions if it dropped its comely but blank protagonist and furnished a bigger platform to its supporting ensemble.